Founded in 1987 by David Packard, the Monterey Bay Aquarium Research Institute (MBARI) is a leader in applying technology to longstanding problems in ocean science. 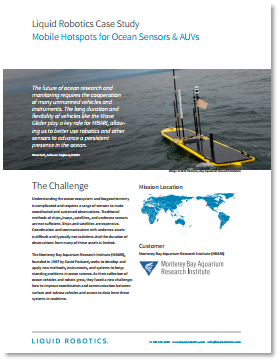 As their collection of ocean vehicles and robots grew, they faced a new challenge: how to improve coordination and communication between surface and subsea vehicles and access to data from these systems in real-time. One solution? A new hotspot payload for the Wave Glider.